Held in the Egyptian Suite in Liverpool’s magnificent Masonic Hall, Liverpool Epworth Chapter No 5381, which is in its 40th anniversary year, has just completed their annual installation. Pictured from left to right, are: (front row) Paul Shepherd, Gordon McConnell, John Doig, Geoff Green and Mark Matthews; (back row) George Christie, Edward O’Hare and Brian Pierpoint.The three principals, John Doig, Gordon McConnell and Geoff Green, along with the companions, were delighted to welcome Paul Shepherd as the principal guest, accompanied by Liverpool Group Chairman Mark Matthews. For the purpose of installation James Whisker took station inside the entrance, before Geoffrey Cuthill was presented as third principal elect by the director of ceremonies Edward O’Hare. George Christie took the position of third principal, when Geoff Green was presented as second principal elect. Mal Myers occupied the second principal’s chair, while Edward next presented Alexander Gordon McConnell as first principal elect. John Doig installed Gordon into the chair of first principal, this being his first occasion in the chair. On his re-admittance, Geoff Green was installed as second principal by Gordon and in similar style Geoff installed his successor Geoffrey Cuthill as third principal. The readings for the ceremony were given by Jim Whisker, Mal Myers and Brian Pierpoint (for the first, second and third principals respectively), while the red robe address was by John Doig, the purple by Edward O’Hare and the blue by Mal Myers, all presented in a most laudable manner. Gordon proceeded to appoint and invest the chapter officers for the coming year, with the address to the companions of the chapter delivered in his usual excellent manner by Paul Shepherd. With the completion of the installation, Paul rose to bring the greetings of the Grand Superintendent Tony Harrison, together with the express wish that all the companions present would continue to have an enjoyable year in their chapter. This was the cue for Gordon McConnell to present, on behalf of the chapter, two cheque’s, one in favour of the Liverpool Masonic Hall Building Fund for £200 and the other for £500 to the MCF 2021 Festival. Paul replied, giving thanks to the benevolence of the companions, who had also given generously on previous occasions in their respective Craft lodges. On this occasion there was an added enhancement to the evening, for with the latest donation to the MCF 2021 Festival, the chapter had now achieved status as ‘Vice Patron of the Festival’. Pictured from left to right, are: Paul Shepherd, John Doig and Mark Matthews. A jovial and well-attended festive board gave Paul the opportunity to bring his own congratulations and warm wishes. In his address, he enlightened the companions on the current issues within Royal Arch Masonry, which the Grand Superintendent wished to draw to their attention. 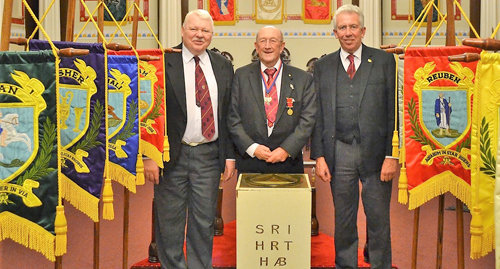 In particular, he stressed the advantages of spreading the word about the charitable work done by Royal Arch Masons and the additional enjoyment gained from membership of the order. To be able to achieve this, he recommended the use of whatever appropriate social media each companion felt most comfortable in using and encouraged the members to keep their group publicity officer informed of any social or charitable events they had planned, so that appropriate coverage could be arranged. He next thanked Mal Myers for the way in which his secretarial expertise allowed the evening to run so smoothly and added, that as usual, it had been a ‘cracking ceremony’ within the chapter room, followed by a ‘delightful dinner. In summary, Paul reminded everyone again that Tony Harrison’s most fervent wish was they continued to enjoy their Freemasonry to the full. Later, in proposing the toast to the first principal, John Doig remarked that the evening was quite a major event as it was the first time all three principals belonged to Woolton Lodge No 6448. Also, worthy of note, is that both Gordon McConnell and Geoff Green had been awarded the ‘Territorial Decoration’, as well as both achieving the rank of Major. John now took the opportunity to present the traditional elephants, first to George Christie, then to the newly installed principals. This tradition, began many years ago by Tom Davies, is to remind the principals of the work before them, for an elephant never forgets. Later, it was the turn of Gordon to say a few words and he expressed his thanks for all those who had taken part in the ceremony and also to the number of visitors in attendance. It was a special delight to have honorary member Paul Shepherd as the representative, particularly as this year he is also the first principal of Jerusalem Chapter No 32. Likewise, George Christie, the Liverpool Epworth Chapter MCF 2021 Festival representative, who is also the first principal of Chapter of Liverpool No 292. Gordon also thanked other principals in attendance, John McKenzie, third principal of Chapter of Harmony No 220, and Geoffrey Cuthill, currently second principal in Provincial Grand Stewards Chapter of West Lancashire No 8516. Gordon next had the very pleasant task of presenting John Doig with the ‘past first principal’ jewel. 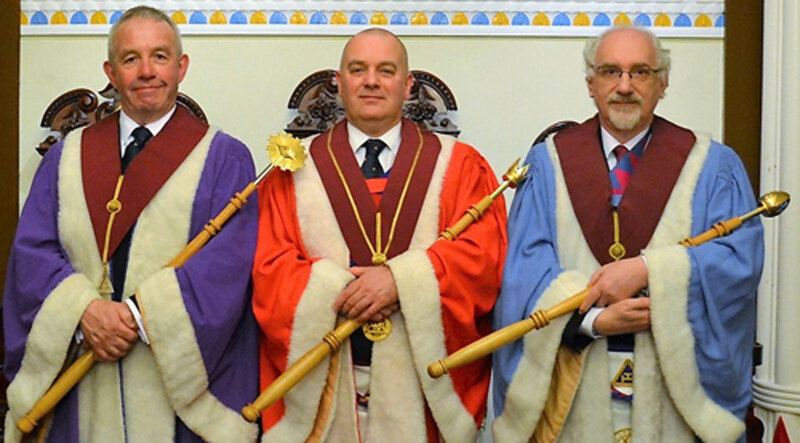 Pictured from left to right, are the installed principals, Geoff Green, Gordon McConnell and Geoffrey Cuthill.